The story of the Glastonbury Thorn has outlived any human and long may the pages in the history books continue to be written. It has survived the ravages of time, destroyers, war and violence and is much more than a simple tree that oftentimes struggles to survive. The Glastonbury Thorn is a symbol of the humanity that binds us together, like the branches that reach towards the light. It is the hope in our hearts that keeps us going through the dark times and it is the actions we ourselves can undertake to grow a better future, not just for us mere mortals that have such a short life-span on this earth, but for the whole of our planet and for all those yet to come. 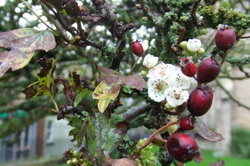 The Glastonbury Thorn has to be a tree with more history, myth and legend surrounding it than any other tree in existence. Its story begins back through the mists to a time when legend says Joseph of Arimathea, following the Crucifixion of Christ, arrived on these shores and founded the first Christian church in England. Recent times have seen this humble tree in headlines all around the world. Morgana West, manager at the Glastonbury Pilgrim Reception Centre found herself thrust into a new chapter in the story of the Thorn.